Invasive plants pose a threat to natural lands because they choke out native species, clog waterways, creating monocultures that disrupt more balanced ecosystems that other species rely on. 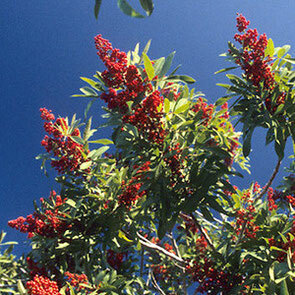 Pictured here is the Brazilian pepper which smothers native vegetation. Such nuisance plants pose land management problems because their eradication is impossible and control is expensive. A complete list of invasive species can be found at the Florida Exotic Pest Plant Council.